From a physics viewpoint, the shafts are too short to take a load other than predominantly longitudinal. I can't think of a paleolithic hafting technique that would have allowed any substantial perpendicular moment - the shaft simply is too short for that. So, unless one side of the "triangle" was pretty much fully covered with wood, hafted, these would have been useless as cutting tools. 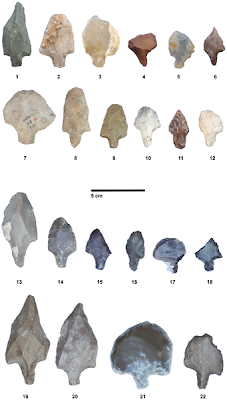 One possibility how these objects may have experienced predominantly one-sided wear is as a throwing stick with a point. So, instead of being thrown like a dart or spear, they may have been thrown by gripping the end of the wooden shaft and whirling the projectile like an axe (a primitive atlatl, where the wrist provides additional momentum, but the shaft remains at the object thrown). In that case, the main load on the shaft would have been longitudinal and pulling, and when striking the target, more often than not only one cutting edge would have been involved. This would be very useful against antelopes, who are known to exhaust quickly, and who after being struck from a distance could have been followed using blood loss traces (either by humans alone or with the aid of dogs).